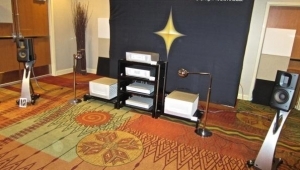 Room 525: Sometimes now, when I am walking room to room wearing my Stereophile badge, I feel a lot like "Babe in BoyToy Land"that felt especially true in the DEQX room. 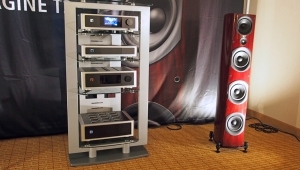 I am listening to a pair of Magnepan MG1.7 loudspeakers powered by a Plinius amp (I am friendly and experienced with both of those products and can imagine what they should sound like together in a normal room), together with JL subs below 160Hz. But wait, what I am really experiencing is the result of the DEQX PreMate+ and HDP-5's digital "witches' brew" of loudspeaker/room calibrations and corrections. 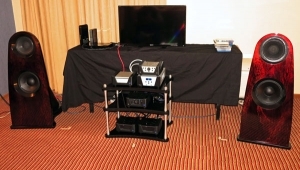 DEQX's latest preamp/speaker calibration technology linearizes the speaker and system in-room frequency response. 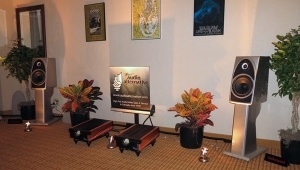 And yes, this technology can and did provide the satisfying effects that flat in-room frequency response always provides. Namely, more wholeness, continuity, and increased naturalness of tone. Equally amazing, I remember 20 years ago experiencing similar operating systems in the rooms of Audio magazine's Bascom King and audio designer/physicist, Arthur Loesch. Perhaps that system was more primitive, the effect was nearly identical. On the surface, everything sounded better (flat in-room response is a highly desirable audio trait)no question. But, very quickly, my brain started asking; at what cost? 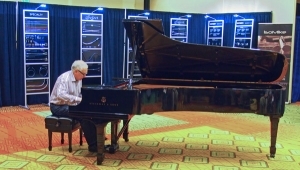 Room 505: George Klissarov in the exaSound room played mellow ragtime and Mahler's Symphony 5 to very good effect. 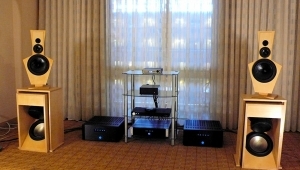 He was showcasing the e28 FC DAC ($3650) using five Magnepan 1.7 loudspeakers, and a Bryston amp. 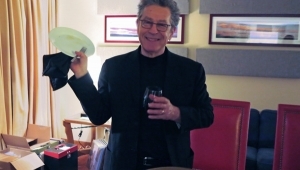 It was fascinating listening while George switched back and forth between five-channel and two-channel. Room 521: I forgot to take notes in the Rogers High Fidelity room. 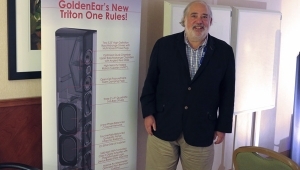 I forgot, because I already know how good Rogers' amps sound and I got caught up in the mad, lets-talk-about-amp-design vortex that is the person of company president, Roger Gibboni. What a fun moment. 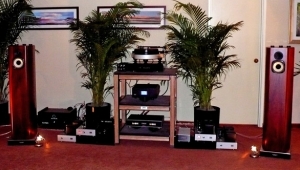 Did you know he has in his possession the original life-size pencil line drawings for the unusual-looking PA-1A phono preamp (beneath the turntable in the photo)? Can you imagine how good these drawings would look framed on a wall? Oh, you want to know about the sound? It was great, but I was only listening in the background. I was watching Roger's eyes and absorbing his exciting stories. I can't wait to chat some more and learn some more . . . from Mr. Gibboni. 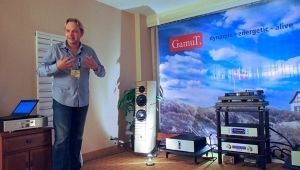 Room 522: I met the amiable Slovenian turntable distributor/guru, Peter Mezek of Pear Audio Analogue. 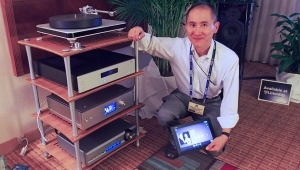 He showed me the full rage of beautiful Pear Audio turntables inspired by the innovations of the late Tom Fletcher of Nottingham Audio. 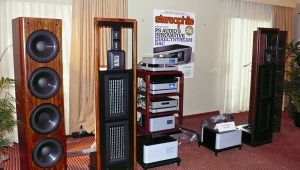 The system consisted of Pear's top of the line "Kid Thomas" table ($9995) feeding a Croft preamp ($5995) into a Pear Audio stereo amp ($9995), which drove the Speaker Lab ESP Contra Bass speakers ($24,995/pair). Room 510: You know, I've been out of audio for a while and I had forgotten just how good and how cost-effectively great the Hsu subwoofers are. Dr. Poh Ser Hsu played Joss Stone's "Sleep Like a Child" and Hans Zimmer's Dark Knight soundtrack and we were both smiling. 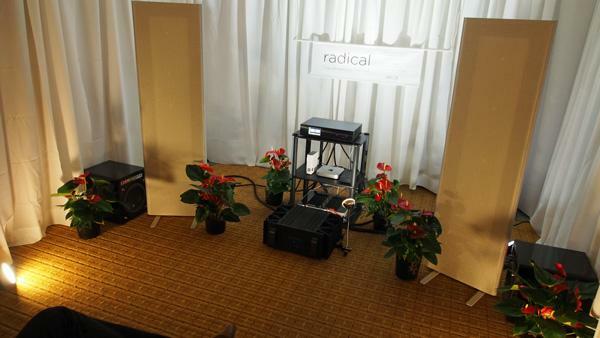 The sound from the modest AB-1 Mk.2 bookshelf speakers ($318/pair) and the VTF-3 MK5 subwoofer ($799) was total musical fun. 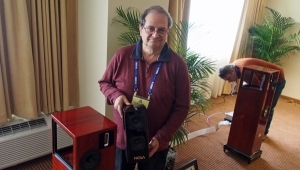 Room 509: Vincent Solbes told me that it took 43 straight hours of CNC machine work to make just one of the beautiful red-finished Voce Audio Trias loudspeakers ($64,000/pair). He swore that if I measured them under dynamic conditions they would present a ruler-flat 8-ohm impedance. Is that really possible? 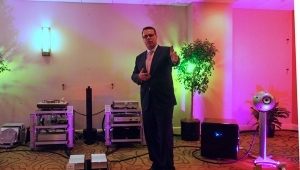 The rest of the system consisted of the MSB Technology Universal Media Transport with Dual Signature Power Base ($10,990), the Diamond DAC IV Plus with Diamond Power Base ($38,999) and the S201 200Wpc stereo amplifier ($17,995). 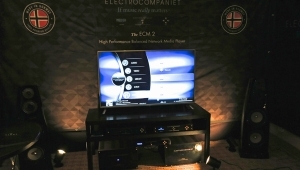 The sound was smooth, elegant and refinedand totally commensurate with the price.